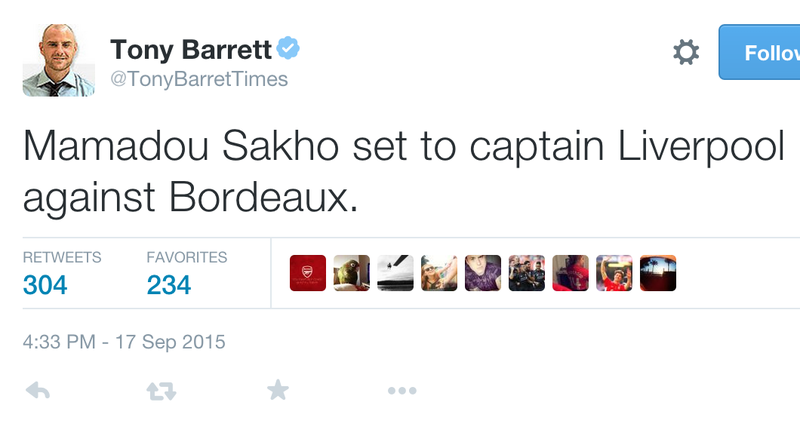 Bordeaux Update: £18m star is Liverpool's new captain for tonight's game. With Jordan Henderson injured, and James Milner rested, Liverpool need a stand-in captin for the evening, but who will it be? After Hendo and Milner - who didn't deserve the vice-captaincy - Skrtel would usually be next in line, and then (arguably) Lucas. However, considering neither of those players made the trip to France, the Reds will have a brand new captain for tonight's game. 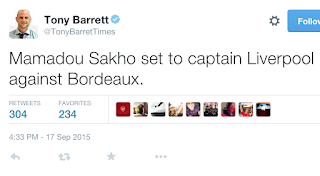 "Mamadou Sakho set to captain Liverpool against Bordeaux". Sakho is the obvious choice, though with his vast experience, Kolo Toure would've also been a good option. I'm just glad it's not Emre Can. Lots of fans/pundits go on about how he's a 'leader', but I've seen precious little evidence of that so far. Sakho - hailed as 'outstanding' by Brendan Rodgers - has captained both PSG (the French club's youngest ever skipper), and the France national team, so he's qualified for the role. Hopefully, the captaincy will give Sakho the confidence he needs to put in a good performance. He hasn't played a competitive game for the club since May 24th, so he's bound to be a little rusty. If Sakho does well, though, it could signal a stretch on the bench for Dejan Lovren, and I doubt many fans will be too upset to see that happen.